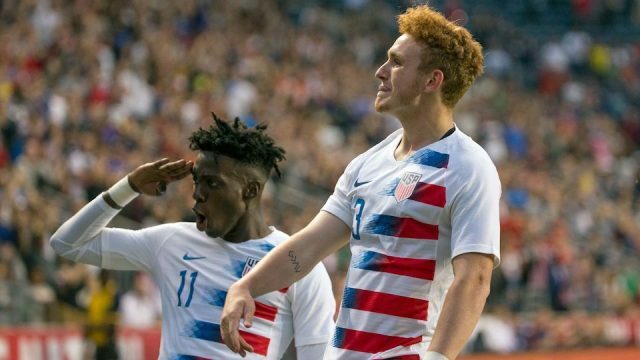 In the first installment of a weekly piece by writer Cullen McIntyre, where he’ll be looking at up-and-coming stars in the U.S. Men’s National Soccer Team, we begin with a well-known name in the U.S. Soccer world, Josh Sargent. Sargent, born in O’Fallon, Missouri on February 20, 2000, is currently 19 years of age with already six caps for the United States National Team. From a young age, he was talented with the ball at his feet, joining the St. Louis Scott Gallagher Soccer Club at the age of eight. He first appeared internationally at the United States U-14 camp in 2013, earning himself a call up to U-15 the same year. He spent five years in St. Louis, attending St. Dominic High School while at the Scott Gallagher Soccer Club. He would move to Florida in 2016 to join the U.S. Residency Program for school as well as training for the U-17 National Team. Sargent truly made a name for himself in the 2016 Nike International Friendlies while apart of the U-17 side, scoring four goals and two assists in three matches. He continued his success in John Hackworth’s 20-man squad chosen for the 2017 CONCAF U-17 Championship, leading the U.S. the final against Mexico where they lost 5-4 on penalties, but qualified for the 2017 FIFA U-17 World Cup. The Missouri native netted five goals in the tournament. Only two days would pass after the CONCAF tournament until Sargent was included in the 21-man squad called up by Tab Ramos for the 2017 FIFA U-20 World Cup. He debuted in the first game against Ecuador, scoring two goals and becoming the youngest ever American to score in a U-20 World Cup. Sargent’s goal in the 6-0 semifinal win over New Zealand tied him with Jozy Altidore, Eddie Johnson, and Taylor Twellman as the United States all-time goalscorers at the U-20 World Cup. He would earn his first senior call up on Nov. 7, 2017, making him the first and only American player to be included in a U-17, U-20, and the senior team all in the same year. He did not make an appearance for the senior team during that camp. It was also in 2017 that the German side Werder Bremen announced that Sargent would join their side on Jan. 1, 2018, signing a professional contract on his 18th birthday. He had a chance to sign with hometown Sporting Kansas City but took the opportunity many of his fellow United States teammates have in the Bundesliga. Upon signing with Werder Bremen, Sargent was put into the into their second side, Werder Bremen II, who play in the fourth tier of German soccer. The U-20 international was told to prove himself in the side, as well as adapt to the high pace of play in Germany. It didn’t take Sargent long at all, as he would score 12 goals in seven games for the fourth division side before earning a spot at the senior level. Sargent would earn his first senior cap for the U.S. Men’s National team on May 28, 2018, in a friendly against Bolivia. He started for a very young American side that won 3-0 over Bolivia at the Talen Energy Stadium in Pennsylvania. Following a horrible pass from the Bolivian goalkeeper, Sargent controlled the ball and placed the ball between the goalie’s legs in the 52nd minute of the game. He would be the fourth-youngest player to score for the USMNT at the senior level until teammate Timothy Weah (aged two days younger than him) scored 15 minutes later. He netted his second goal in his second start in a 1-1 friendly against Peru on Oct. 16, 2018. Kellyn Acosta played a low driven ball to the top of the box for Sargent’s one-time placed finish to the bottom left corner. His ability to score so frequently has had fans calling for his permanent placement up top for the United States side. On Dec. 7, 2018, he made his first appearance in the Bundesliga in the 76th minute against Fortuna Düsseldorf, scoring on his first touch in the 78th minute. The highlight circled across the social media pages of every U.S. fan, as the starlet of the U-20 national side took only two minutes to score his first Bundesliga goal. Sargent’s second goal for Bremen came in a 3-2 loss against Bundesliga side Red Bull Leipzig. Yet again, it would not take long for Sargent to make a quick impact, scoring in the 77th minute after being subbed on in the 66th minute. The goal came from a creative control and hold up play from Yuya Osako, who played the ball perfectly into the feet of Sargent to draw the game level at 2-2. In the current Bundesliga season, Sargent has made nine appearances for Bremen but is yet to get his first start for the German side. For the 19-year-old, his inconsistency of play time in the Werder Bremen lineup has caused him to not appear in the USMNT since November of last year in a 1-0 loss to Italy. He most recently appeared for the U-23 United States team in the March international break in the teams 2-0 loss to Egpyt’s U-23 team, and he started in the 0-0 draw to Netherland’s U-23 side. There is certainly more to come from the young Missouri native, who’s been touted as America’s future greatest forward of all time, as well as drawing comparisons from Bundesliga legend Claudio Pizzaro. United States faithful will hope he can reach the expectations he’s been given, and lead the talented American side far in the 2022 and 2026 World Cups.